We are one of the best supplier of Stainless Steel Bread Bin. Our reputed entity is engaged in supplying Stainless Steel Bread Bin. We are prominent supplier of Stainless Steel Bread Bin. 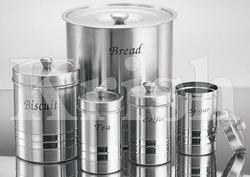 Banking on our enriched industry experience, we are able to supply Stainless Steel Bread Bin. We are Leading Manufacturer of Steel Trash Bin in Vadodara. In order to meet excellent quality standards, we are supplying Stainless Steel Bread Bin. We are main supplier of Stainless Steel Bread Bin. Our company has been successful in winning appreciation from the clients as one of the most prominent names in the trading of Stainless Steel Bread Bin. 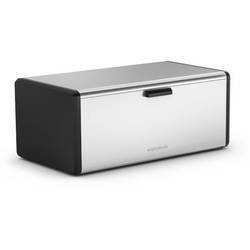 We are amongst the most reputed names in the industry, offering Stainless Steel Bread Bin. - It is ideal for storing Bread., it keeps bread fresh for longer period of time. - It is also used for keeping Cakes, Pastries, Cream-Rolls etc. - It keeps them fresh and soft. Green Leafy Vegetable like Palak, Methi, Bhindi, Coriander can also be kept in it.